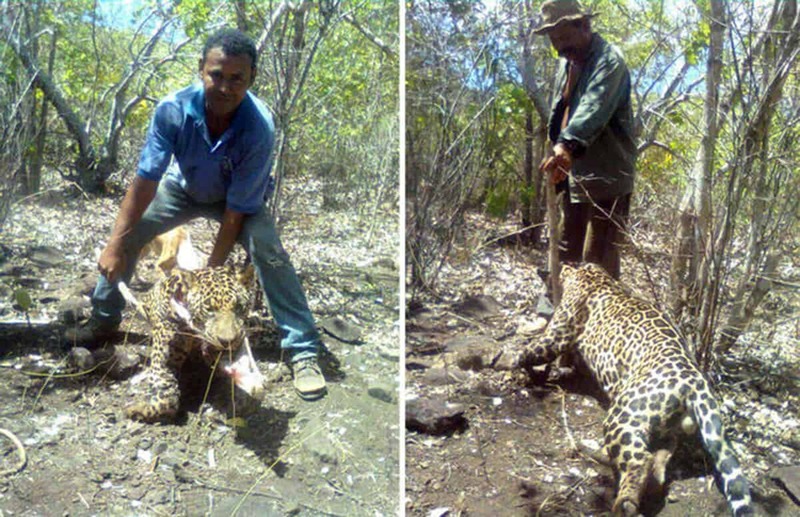 Photographs of two men posing with a dead jaguar circulated widely on social networks in Costa Rica on Friday. Now, animal rights groups are speaking out against the kill. The Liberia Association of Animal Protection (ALPA), in the northwestern province of Guanacaste, posted the photos, which appear to have been taken near the Santa Rosa National Park. ALPA said they had information that the two hunters are residents of a farm located next to the park. The group said it had received complaints that the same men killed other jaguars in the area recently because the wildcats attacked their cattle, according to a Facebook post. Jaguars are considered endangered species in Costa Rica. “To prove this felony will be almost impossible due to our country’s weak laws, but the pictures are proof of how people continue killing our animals. We would really appreciate if all of you share this message and help spread the news,” the post added. Last January, President Laura Chinchilla signed a new law that prohibits hunting for sport in Costa Rica. The law sets fines for sport hunters of up to ₡1.5 million ($3,000) and allows hunting only for personal consumption in limited circumstances, scientific research or wildlife population control.